This eye-catching bottle has some really high-end finishes that make it a very nice vehicle for your messaging. It features a stainless steel threaded lid and base. The added metal to the base looks cool, to be sure, but it also adds a level of protection against drops. Utility meets design in the best way! Our staff tester loved the larger, 25 ounce capacity. She said that while it held a lot of water, it still fit into the water bottle pockets on all the bags she tested (she personally used it with Bulletin Bag’s Cinch Pack with Mesh Pocket, and said it fit great!). While Tritan water bottles are dishwasher safe, we do recommend hand-washing this bottle to preserve the integrity of the stainless steel base and your printed design. That can be a bummer for some, but all you need is a bottle brush and some dishsoap! The one thing our staff tester didn’t like is that the design doesn’t allow for a carry loop or carabiner. As she’s tested lots of our bottles, it’s become a personal preference to have a way to carry a bottle hands-free. Depending on the intended use of the bottles, this might be a consideration for clients as well. 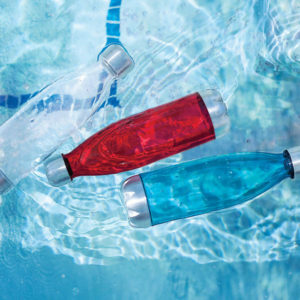 So, if you love retail inspired design, but can’t afford the price that comes along with insulated water bottles, our h2go Bottle Bottle might be just the Tritan bottle you’ve been searching for! As low as: $5.99Minimum 48 pcs.